As useful and high-tech as touchscreens are, they are also very cold and impersonal. They don’t yield to the touch or provide tactile feedback for the user, resulting in a very one-sided experience. 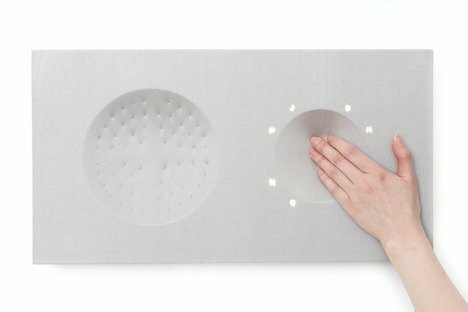 The Tangible Textural Interface (or TTI) from designer Jo Eunhee is a sound system with a different type of touch interface which makes the whole experience much more intimate. 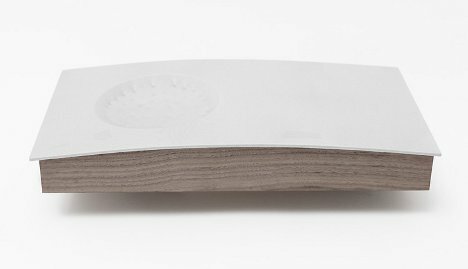 Instead of twisting knobs or sliding fingers around on a cold touch surface, TTI requires users to press their fingers into a soft, responsive tactile fabric interface. The current working prototype allows users to fiddle with the volume, change the track, and alter the balance of the sound by simply pressing on the fabric surface and moving the fingers in a variety of ways. As the user manipulates the settings of the sound system on the right side, the left side moves and morphs in concert. The flexible fabric surface is distorted in specific patterns in response to the user’s movements, then moves along with the beat of the music. The prototype could introduce a new type of interface – one that is not cold and unfeeling but personable, responsive and comfortable to interact with. See more in Audio & TV or under Gadgets. September, 2012.